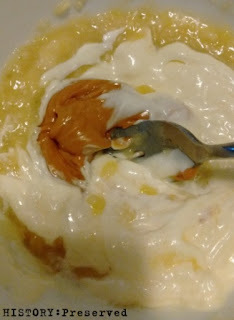 I'm posting later than I wanted, but I actually tried this week's vintage banana recipe for Banana Peanut Butter Mayonnaise! 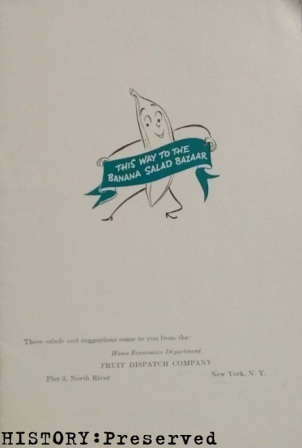 It comes from my cookbook "This Way to the Banana Salad Bazaar", ca. late 1930s-early 1940s. 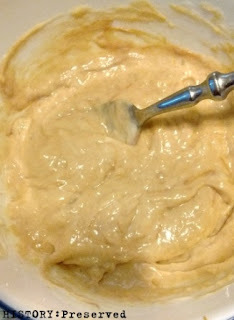 I bet you've already wrinkled your nose in distaste at the recipe, right? I mean, who in their right mind would eat a weird combination like that?! Well... I would! I've mentioned before that I grew up eating peanut butter and Miracle Whip sandwiches, so this recipe seemed totally reasonable to me. haha! 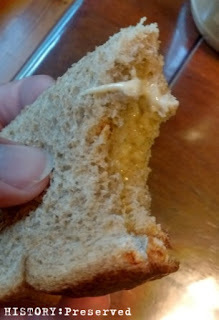 I really think people today underestimate how flexible mayo is in recipes and this one is no exception. This recipe is super easy. 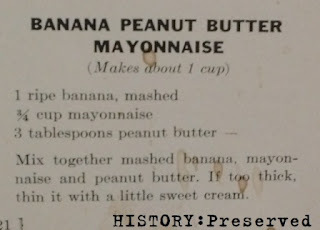 Mash the bananas, stir in the pb and the mayo. Done! Yes, I agree it turned out to be a weird, unappetizing color. Are you brave enough to give this unique recipe a try?